On Friday, November 1, 2013, more than 500 people came to the Sahmyook Central Church, a Seventh-day Adventist Church in Seoul, South Korea, to attend a Religious Freedom special program for North Korea. Dr. Jairyong Lee, the IRLA President in the Northern Asia Pacific Region, which includes North Korea, China, Taiwan, Japan, Mongolia, gave a report on several humanitarian initiatives done in cooperation with governmental authorities. Other speakers underlined the help needed to facilitate the integration of North Korean refugees into South Korea. A prayer session was led for the people of North Korea and for religious freedom there. 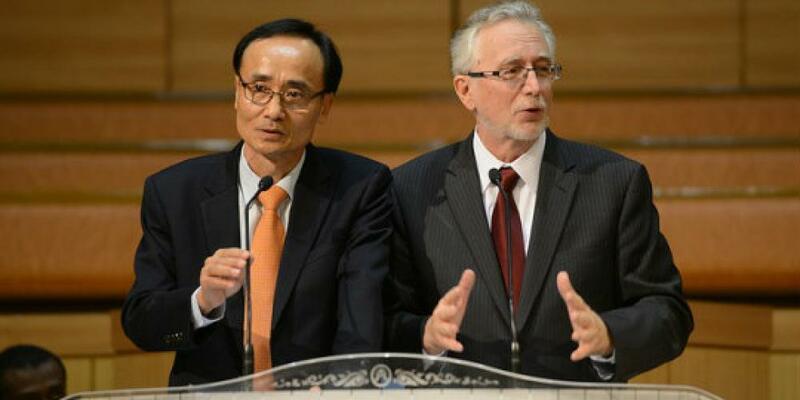 IRLA Secretary General Dr. John Graz gave a report on the world state of religious freedom. "If religious freedom is a gift from God," he said, "for every place we have it, we should celebrate it publicly and give thanks to God and to the country for it." The 500 participants stood up to express their decision to support religious freedom for everyone, everywhere. It was the third event for religious freedom held in South Korea since 2000. The two previous events culminated into a symposium and a festival. The organizers of the current event were Dr. Kim Young Soo and Pastor Chi Yan Moon. A Religious Freedom Leadership Seminar was held on the days following the special program with contributions from Dr. Graz and IRLA Deputy Secretary General Dwayne Leslie. Participants came from Mongolia, Japan, Taiwan and Korea, and gave reports about religious freedom in the various countries in Asia. Also, the participants planned several projects, like a symposium in Mongolia and Japan; a religious liberty concert in Seoul; and the Second Asian Congress for 2016 which will be followed by a festival. Dr.
Graz said he was very impressed by the excellent organization of the event and hopes that a global religious liberty event can one day be organized in Korea.